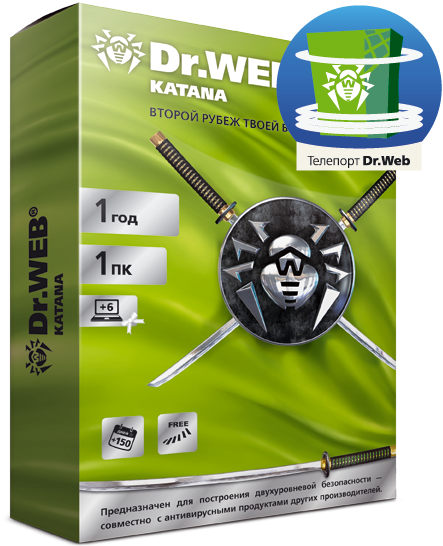 Dr.Web Katana is a whole complex of Dr.Web anti-virus technologies of a new generation designed to be ahead of the curve. It will protect against threats that are not yet known to your antivirus. Non-signature antivirus for preventive protection against the latest active threats, targeted attacks and penetration attempts, including through zero-day vulnerabilities. It is recommended to use as an add-on to antivirus software from other manufacturers (Kaspersky, ESET, Avira, Avast). Does not conflict with antiviruses of other manufacturers, does not require any configuration, for Windows 10/8 / 8.1 / 7 / Vista SP2.XP SP2 + (32/64 bit systems). Independent - does not require any configuration and begins to operate effectively immediately after installation. Flexible - a set of pre-installed protection scripts and the possibility of fine-tuning make it possible to comprehensively control the protection process, adapting it to the needs of the user. Standalone - protects even without PC access to the Internet. Universal - protects the widest range of Windows operating systems - from Windows XP to the latest Windows 10. Non-conflict - can work in conjunction with antivirus software from other developers to enhance the protection of your computer.